Multi-detector Camera System　EI310 – Shodensha Vietnam Co., Ltd.
What is the EI310 Image and Visual Inspection software? 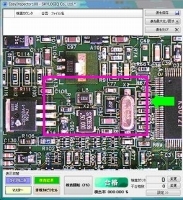 It is easy operation and low-cost image inspection software, in order to connect to 1-5 pieces of USB cameras commercially available and for all purpose. 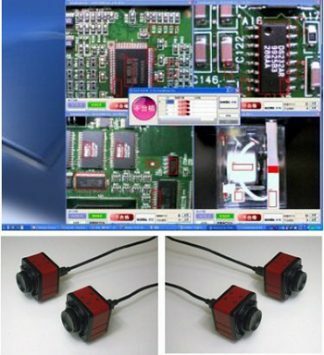 You can easily build the image inspection system with low cost. If you register a good quality product image as a master image, the image inspection software can detect the difference in shape, color, position, and about dimensions and/or angle at the same time, from the inspected image. Video demonstrations of the software are below! We will send you a free CD demo version. Or download here. Language support: Japanese and English. ※The demo version does not carry the multi-camera function. ※Some PCs may not start with only the USB key that you purchased. Please download this in that cases.Download here. It have the same function of comparing the result of color, shape, dimension and angle measurement. Furthermore multiple cameras can be used. Display result, successful rate and number of search. Can frame multiple measurement areas and option can be selected by each frame. By combining 2 options together, result of any error can be showed. Only need USB camera and computer. Start the checking by a single click. By connect to the I/O unit option, seach can be done by foot switch. By connect to the I/O unit option and PLC, inline auto search will be available.